Practice sequencing and balancing with colorful blocks and activity cards. Build your tower to match the image. Blocks are lightweight and easy for young children to grasp. Helps to strengthen gross motor and visual processing skills. Includes 12 activity cards and 6 blocks. Step on a spot to make it squeak! Blend movee- ment activities with auditory stimulation. Helps with learning foot placement and motor planning skills. 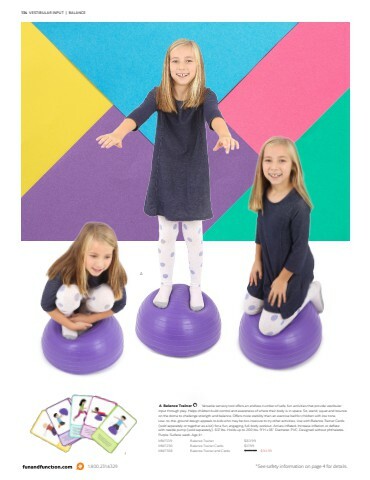 Supports sensory integration activities. In- cludes 6 spots weighing 2 oz. each with squeaker inside and non-slip backing. 8 Diameter. Vinyl. Red, orange, yellow, green, blue, purple. Surface wash. Use with adult supervision.